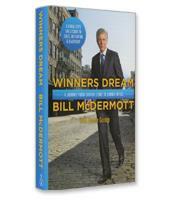 In Winners DreamM, Bill McDermott—the CEO of the world’s largest business software company, SAP—chronicles how relentless optimism, hard work, and disciplined execution embolden people and equip organizations to achieve audacious goals. In Winners Dream, SAP CEO Bill McDermott describes his journey from his blue-collar roots in Amityville, New York to becoming CEO of the largest business software company in the world. Unlike many CEO books, Winners Dream is structured not as a book of lessons but as a straightforward chronological autobiography — although nearly every page is infused with business wisdom told through compelling stories. The young high school businessman determined that he had three types of customers: senior citizens from a nearby senior home, local blue collar workers and high school kids hanging out after school. For the seniors, many of whom did not like to leave their homes, McDermott set up a delivery service. For the blue-collar workers, many of whom were paid on Friday and broke on Sunday, he set up a credit system — they could buy on credit during the week but had to pay with the next Friday paycheck. For the high school students, he offered something exceedingly simple: they could all go in the store. At that time, the major chains only let students in the stores in small groups because of the fear of stealing. Thus, McDermott writes, kids with money in their pocket were forced to wait out in the cold. McDermott’s high school experience offered him a clear lesson: To succeed in business, you must give your customers what they want — and that means you must know what they need. It was a lesson that would guide him when he had moved far from the corner deli. A successful retailer even in high school, McDermott was clearly born with a fine business acumen. But he also inherited a very strong work ethic from his parents and was driven by ambition and confidence. When he applied to Xerox and was told that HR would be contacting him with a response, McDermott asked the last interviewer to hire him on the spot instead — which he did. For McDermott, passion, planning and confidence are key success factors for a business career. But perhaps even more important is empathy — understanding the needs of the people you sell to and you work with. It was empathy that made his small deli a success during high school, and when in 2010, as SAP CEO, he was working on a new strategy to strengthen the future of the largest business software company in the world, the questions he asked are surprisingly similar: Who exactly are our customers, and what do they want? For SAP, customers were any possible end users of technology. And what they wanted was compatibility with multiple mobile devices and access to cloud computing — and those are the areas in which SAP would move forward. Winners Dream is subtitled A Journey from Corner Store to Corner Office. It is a journey that illustrates, with every step, inspirational business guidance and solid leadership lessons for anyone striving for a similar journey in their lives.